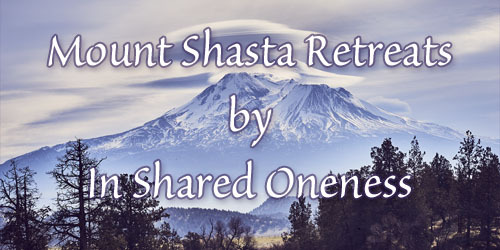 In Shared Oneness offers customized transformational spiritual retreats in the activating beauty of Mt Shasta, northern California, USA. Individuals, couples, families and groups are assisted in discovering their fullest Unique Self Expression beyond limiting beliefs and fearful thoughts. Our next public retreat, ‘Animal Guardian’, will be offered May 4-5, 2019 in Mount Shasta. In Shared Oneness retreats are unique in that they are highly experiential and are facilitated by three way-showers, each with their own unique personal expression of the Oneness. Each retreat provides an opportunity to leave behind the stress and distractions of your usual life and immerse yourself in a peaceful place within. You get the time and space to uncover, review, release and reformulate a new perspective on life, and fully manifest your personal empowerment and creative self-expression. You may benefit from our retreats if you are looking for a refinement of awareness, an opening to the next level, and if you are open to deepening and expanding in a heightened field of light. so that who you Are can emerge. In Shared Oneness is a unique union of three experienced facilitators who are Consciousness educators, coaches and way-showers. Angelique Jan Pera, Mary Saint-Marie and Edward Maesen hold Sacred Space for your Wholeness. We are not teachers in the mental intellectual sense; we are WayShowers. We don't follow a specific creed or teaching, but each facilitator draws from their life experience of conscious awakening to assist you in your own awakening. We help you access your authentic Soul voice. You are already the True You. You may have some beliefs in your way that make you believe in separation; we help you get past those beliefs. As we hold space beyond beliefs, we allow you to get there as well. We hold Wholeness in heart, mind and being. Personal balance comes from knowing the Self, understanding our heritage and family dynamics and beliefs, the local community in which we live, and the global community of which we are part. We are each one unique aspect of the Whole; each one here to express its unique piece of the Source of Life. Knowing Self creates a strong sense of “I” as a piece of this Whole; Self in relation to family, Self in relatedness to community, Self in relationship to mass consciousness and mass experience. A large portion of what is on mainstream television carries the elements of fear, violence, war, power struggles, lack, or continuous reliving of scarcity. These are the personal collective stories of seeming separation from Source. When you truly feel Source, Presence, God, the nameless Infinite, all you feel is Love and the desire to share with all. In realizing your Spiritual Identity, your worldly identities will be exposed. You move beyond. Attachments and limited stories cease to be. Our experience of the Undivided One affects what we feel, say and do. Likewise, all we feel, say and do affects our experience. Realize and discover the difference between human thinking and Divine Thinking. Discover and feel that Inexhaustible Source within. That is the Absolute undiluted Truth of One Being as the many. Come to your Realization of Life as moment to moment Living Ceremony. Acknowledge It. Claim It. Experience It. Realize It. It… this Essence… is what and who you are. It is the very substance of Creation in everyone… everything… every place.